Tables of lay people and clergy sat in the dimly lit auditorium at St. Thomas of Villanova Parish in Rosemont Friday, May 9 and focused on the projector screen detailing a talk by Father Thomas Dailey, O.S.F.S., on the new evangelization in the Catholic Church. He called for broadening the presence of faith and religion on the Internet, notably through parish websites and social media. It began with Morning Prayer led by Father John Stokely, parochial vicar at St. Robert Bellarmine Parish in Warrington, which preceded Father Dailey’s talk. That was followed by a talk by new media consultant Tom Shakely. Father Dailey used common examples, such as tech giants Amazon.com and Apple, emphasizing the staggering trend toward digital media and the necessity for the forum because of its dominant marketing principles. Radio required 38 years to attain 50 million listeners. The Internet needed just four years to gain 50 million viewers. Amazon’s suggestion bar, shown every time someone views a book or one of thousands of other products, makes people consider buying more, which they often do. The experience changes the way they think, Father Dailey suggested. The world, he said, is wired whether we like it or not. He also entertained bringing these principles to the faith forum and questioned how to apply Catholic values to the Internet. This line drew laughs from the audience members, one of which was Sue Benzie, who attended as a part of Lighthouse Catholic Media. 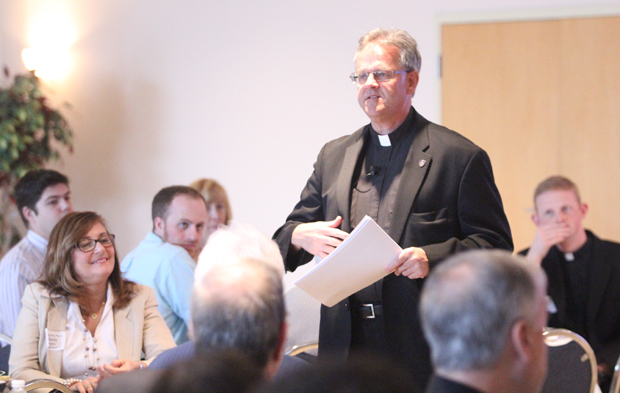 The Internet brings up the dilemma of absence versus presence, Father Dailey noted. A person can occupy space in close proximity to others but remain consumed in digital media while maintaining connectedness to a wide variety of people, friends and information. This individual is present to the digital sphere but absent to the world around him or her. 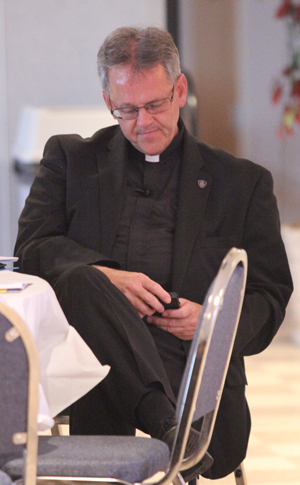 Father Dailey also emphasized the ubiquity of the Internet. The medium is always available and not something an individual turns on and off. He emphasized that the way the church speaks and teaches needs to change with the times because the Internet is now the dominant media platform. 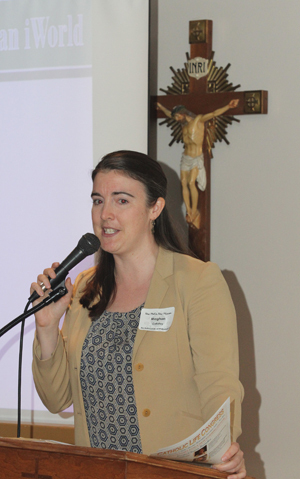 Meghan Cokeley, director of the archdiocesan Office of the New Evangelization, said most parishes aren’t aware of the available tools. 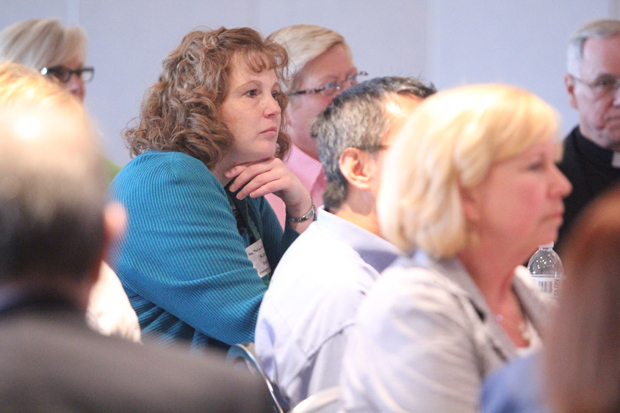 The event’s goal was to give people ways to implement the new evangelization on their websites. Some parishes, though, don’t have the websites to promote Catholicism. Dailey reiterated a hope to change that dilemma. Brendan Monahan is a freelance writer in Plymouth Meeting. I Think teaching the scriptures is great as they teach it the backdrop would be developing everyone in the area of Apologetic’s. I never realized the Importance and history of the early church Fathers. The Tradition is one of the Ignored Pillars of the church. When talking about scripture with Protestants we as Catholics have to recognize Our Rich and Glorious History.There are Bible software’s that relate bible passages to early church fathers writings. We must learn about the Physical development of he Old testament , we must recognize the segue-way from Judaism to Catholicism in Jesus Christ and the apostles.We must understand the NEW testament as the new Covenant and appreciate with fellow Catholics and non Catholics How every Book in BIBLE was discussed for centuries and it had to meet one Major criteria it had to contribute to the Liturgy of the Eucharist. The Whole Point of Our Holy Mass. Teaching some Background of how the apostles trained for their roles as Missionaries. BTW it was a Boot camp so when they went out to evangelize they taught the 85% Illiterate populations THE LORD”S Prayer, 10 Commandments, The letters Paul & Peter then teach in a Homily type way they would Repeat the Prayers of the EUCHARIST..Christ stated and then Share Bread & Wine… This evolved in 2nd Century to a formalized HOLY Mass by St Justin Martyr. We need to Understand the Languages Spoken during the 1st Century and what Apostle Greek Hebrew Aramaic Latin to understand why the Bible is originally in different lengths of Letters. When you can discuss this development of the Bible and share in your storytelling that the REAL PRESENCE was evident and Obvious to ALL Apostles & early Church fathers. Walking someone who is an evangelical through the entire History of Bible through 1st Millenium eliminate initially the Jujitsu evangelism of Scripture Passage by counter Passage Combat. You are overcoming Objections before they are presented. This is a less confrontational manner to evangelize. I have tried point counter point approach it leaves you flustered and quickly forgetting Christ Command to Love your neighbor as your self, which kinda defeats the ultimate purpose of evangelization. Bringing a Non Catholic to EUCHARISTIC Adoration for 15-20 minutes and have Jesus Christ takeover is a win -win approach. If the person is moved you might bring them to Sunday Mass or a Prolife 1st Saturday Mass. Our Sunday Bulletins should be seen as a re-evangelizing tool linked thru Parish Website. Sharing Church history around the Gospel Psalms & Epistles. Written by Parishioners for Parishioners vetted by Priest not in canon lawyers legalese.. Share Today’s Problems with similar problems in Early Church History ie: marriage Homosexuality Abortion. Share Reminders of Novena’s Popes Intentions .. Explain again Indulgences, Angels , St Michael Archangel Prayer history Advent.. Church s role in science. Origination of Crusades.. Religious persecution in England mexico France Spain relate to today’s Persecution etc..
Scripture Study led by a priest should be given once a week for Adult Faith Formation. A Classroom-like setting, as at a Catholic College, would be very conducive for learning God’s Word, reflecting upon it, and putting it into action in one’s life. It is necessary for us to evangelize from within before we can go and spread the Good News throughout the world! It is important that our priests use the knowledge that they gained in seminary. It will not only revitalize the Faith of the people but will also flame the fire within their own hearts. 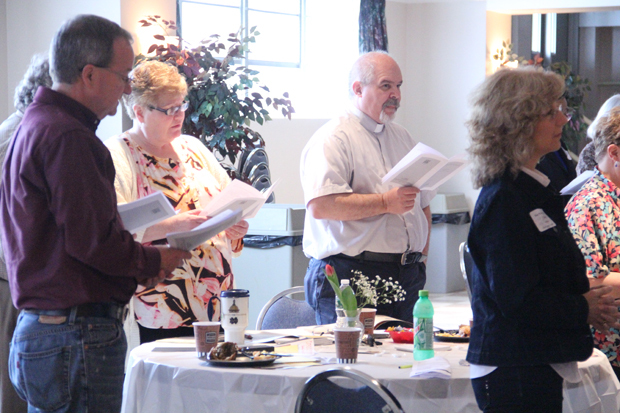 An Adult Scripture Study should be available in each county within the Diocese…maybe even a few in each county. Praying that this may become a reality! Thanks, Brendan, great coverage! It was a great day and so glad to see so many parishes/ministries represented.